Luer Lock are an inexpensive and effective disconnect system. I think these are typically used in the healthcare industry, Luer Locks provide a solid, pressure capable connection with a quick twist. You could use Luer Locks throughout your primary disconnect system throughout your kegerator CO2 system if you wanted to. I used valved QDs for most of my keg lines, see below, and Luer Locks to operate a “utility” CO2 line. One of my CO2 lines has a female Luer Lock on it. I have a selection of attachments that consist of: The attachment, 5 inches or so of CO2 line and a male Luer Lock. With this setup I can easily swap out more specialized attachments that I don’t typically need to be hooked up all the time. Tip: In my experience it can be difficult to get tubing onto Luer Locks. If you have this problem, try soaking your tubing in warm/hot water. A picnic tap. I put a length of tubing on the end of this and use it to flush receiving vessels with CO2. A Cornelius gas quick disconnect: Use this line to pressurize and serve a keg as you would any other line. A Cornelius liquid quick disconnect: Use this line to flush a keg with CO2 from the bottom up through the liquid out dip tube. A standard 1/4″ female flare fitting. I use this to hook up my Blichmann Beer Gun among other things. A Ball Lock Cornelius post. 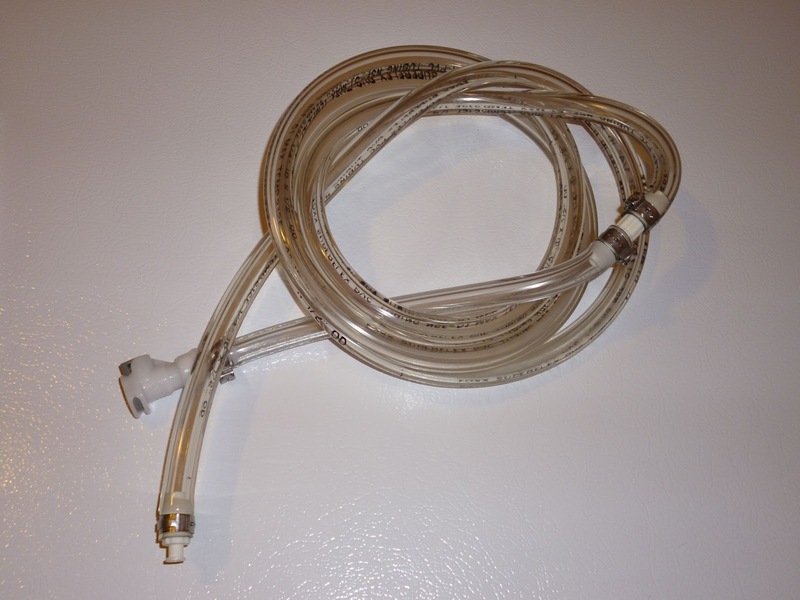 When I transfer from my fermenter or from keg to keg, this attachment allows me to purge the entire length of tubing, disconnects and the receiving keg (from the bottom up) via the liquid out dip tube. I used several fittings to accomplish this, but an easier and cheaper option is now available. See below. A length of CO2 line to easily extend your CO2 runs. This is a picture of the CO2 line I use with these utility attachments. These Luer Locks are made by Cole Parmer. 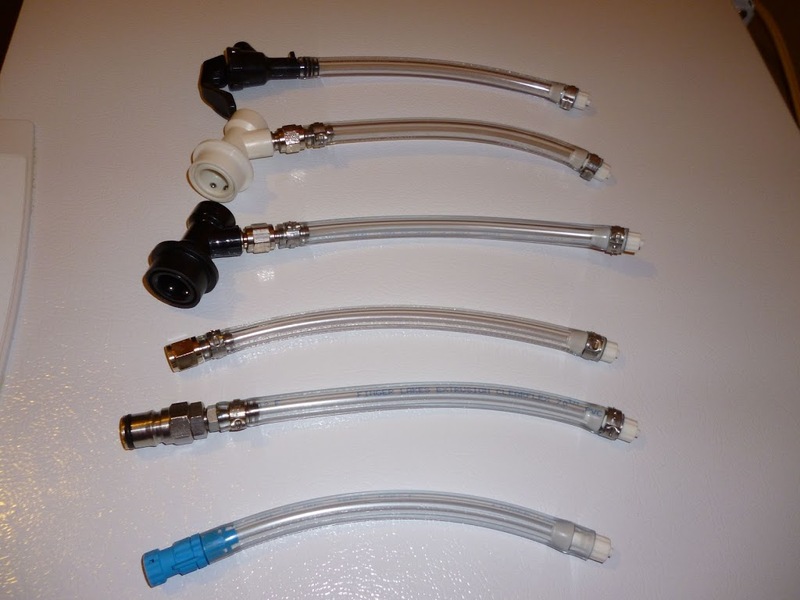 They feature 1/4″ barbs to connect to compatible tubing. I asked the manufacturer for the PSI rating of these disconnects. I was told… “Thank you for your email. the fittings AO-45502-20 and AO-45505-19 are male and female fittings and compatible. The Psi rating for these fittings together is 100PSI”. Note: These are not the exact Luer Locks I use. They’re very similar but from a different manufacturer. The ones I used seem to have been discontinued. Kent Shut-Off QD Set – Soda Bottle Cap H482 – Use this to carbonate in a 1 or 2 liter soda bottle. Also use to pressurize a 1 or 2 liter soda bottle for easy transport. Stainless Carbonation Cap with 5/16″ Barb Ball Lock Type, Fit Most Soft Drink PET Bottles – my ball lock utility line includes several fittings that are relatively costly. Finding compatible threads can also be a trick. This fitting accomplishes the same thing. Note that it has a 5/16″ barb. You should be able to use this with 1/4″ ID tubing. If it’s tight. Soak your tubing in warm/hot water. I use Oetiker Clamps for my liquid, CO2 and utility lines. Luer Lock connectors are not what I would call “quick disconnects” meaning that they are not valved to allow easy disengagement while pressure is turned on. You need to turn off CO2 pressure to disengage these. Tip: If you’re using these for kegs, disconnect the ball lock gas QD before you disconnect your Luer Lock. This will prevent the keg from emptying itself of CO2. Of course you could use all valved QDS or all Luer Locks in your kegerator setup. I use a hybrid approach. Valved QDs for most of my lines and Luer Locks for these utility attachments. This entry was posted in CO2 Hardware, Disconnects, Draft, Projects, Reviews & Top Posts, Top Posts on September 12, 2011 by admin. Quick question – do you think that 1/4” Luer fittings would work for 5/16” gas line? Thanks. Hey Scott… My guess is yes, with a clamp, but please don’t hold me to it if it doesn’t work. Anyone else try this? I think the vast majority of gas lines out there are 5/16″ ID. Great Tip! I bought me some and set it up air tight and do not even need to use clamps. Works great for me.